It is said that one of the 64 kings of Nan assigned his officers to cut a couple of large timber trees from Khun Samoon forest and craft the stumps into 100 khan tokes (food trays) for the workers. The main logs themselves were carved into two giant boats, 100 men spending two years in the wild to achieve this. Ten elephants then had to drag the huge canoes out of the forest to Nan River at Baan Puang Phayom where the king admired the large boats named “Tai Lah Boat” and the other ‘Tai Thong Boat” being raced. 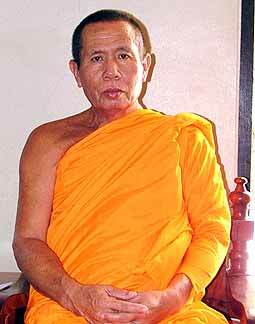 Phra Kroo Phrome Weera Soonthorn, head monk of Baan Tone Hang. 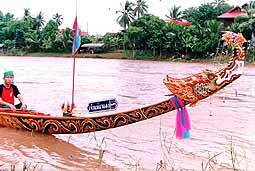 More boats were carved for racing purposes using the two boats as a model and a long boat racing event, entitled “Tan Guay Salak” (to present Guay Salak) was set up. The lucky winner would receive betel palm, Camellia relish, fruits and food as rewards. 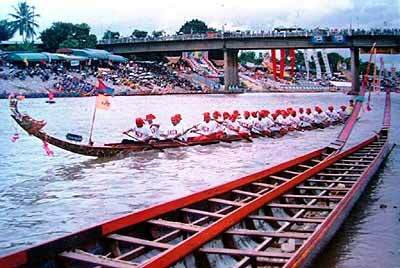 From that rather romantic beginning, the “Nan Long-boat Race” has become a traditional annual event. 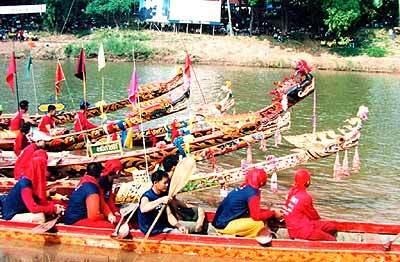 The race takes place in September every year, and each village can send one or two boats to the competition, the winners will then represent their village at the competition on the provincial level in October. 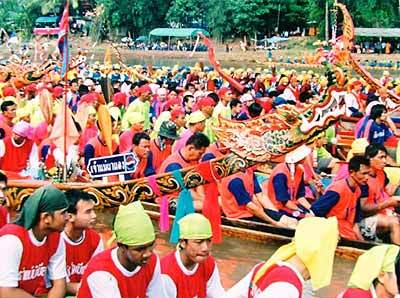 We went to Baan Tone Hang at Tambon Pa Kha in Tha Wang Pha to see last year’s winning boat, medium-sized with 40 oarsmen, which had previously won a cup presented by the Thai prince. Having talked with the abbot of Niko Tharam Temple and Phajon Maiya, head of village at Tambon Pa Kha, we learned that this particular boat called “Pech Champee” was made from a tree with scented white flowers. 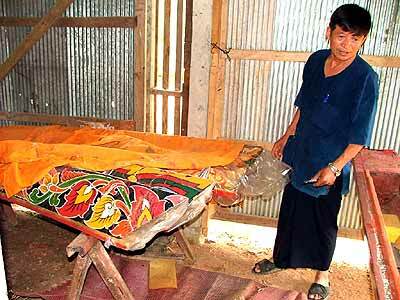 Four villagers cut it from Doi Phu Kha in Pua, Nan, and dragged it with the help of an elephant to the village, which took them several days. The boat is 50 years old but still in excellent condition. 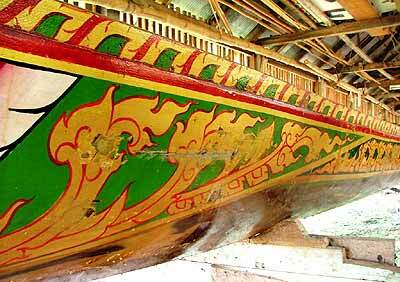 This boat is unique because its prow and tail are carved in the shape of King of Nagas image, and the body of the boat is decorated with Thai art. 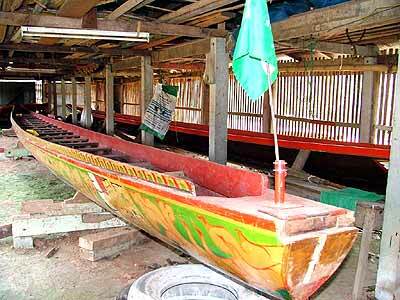 Some of the boats in this area are more than 150 years old, and have become a Nan province symbol. 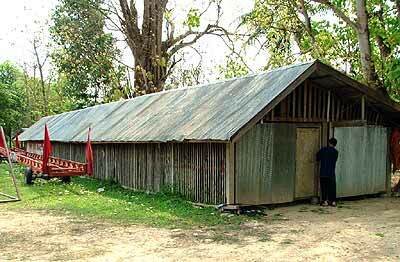 Storage for Pech Champee, the Baan Tone Hang boat. Inside, the boat Pech Champee sits with its bow and tail dismantled. Beautiful Thai art on the body of the boat. The head and tail of Pech Champee are kept well protected. Lining up for a long-boat race on the Nan River. Long-boat races in Nan, on the Nan River. Boats getting ready for racing. Members and friends of Skål International had their second social gathering on Thursday, April 28 at the Rydges Amora Tapae Hotel following an invitation from GM Arie de Keijzer. Cocktails and canapés opened the social networking evening for people from the travel industry. 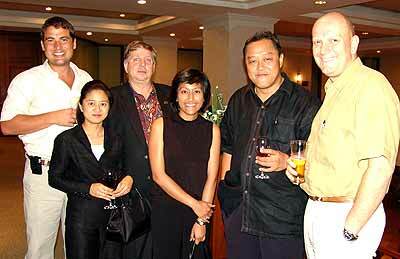 (From left) Jason Friedmann from Four Seasons Tented Camp Golden Triangle Thailand; Chompoonut Suntornpong, Mandarin Oriental Dhara Dhevi Resort; Lars Magnussen, Niramol Udomsilp from Mandarin Oriental Dhara Dhevi Resort; Sun Suebsaeng, President Skål International Chiang Mai and Northern Thailand and MD Mandarin Oriental Dhara Dhevi Resort, Andrew Harrison, General Manager Four Seasons Resort Chiang Mai. After the assembly of Skål International Chiang Mai and Northern Thailand at the Amari Rincome Hotel in March, the second meeting showed an increasing interest to arrange such informal get-togethers of people from the tourism sector and related fields. 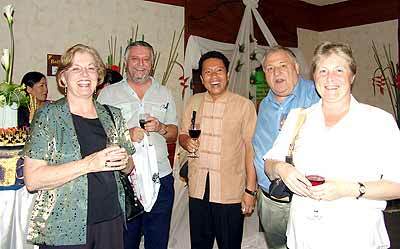 Seen networking (from left) Becky Lomax, David Hardcastle, Good Morning Chiang Mai; Wirat Thong-ural, GM Tao Garden Resort; Norman and Eileen, visiting Skๅl members from Skål International Pattaya and the East. During the evening, discussions were held regarding agendas and proved that there is a real need for networking. In this age of globalization, personal contacts are getting rare and people are looking for real values in daily life. To fill the widening gap of isolation, the values offered by Skål International sound simple: Have fun, good health and enjoy life as much as possible. Skål members and guests in the ballroom of Rydges Amora Tapae Hotel. Skål President Sun Suebsaeng offered to bring guest speakers in the months to come, who all work towards the same goal, to increase tourism and income for Northern Thailand and who should get together with the expatriate community and exchange ideas for a better understanding of each other. 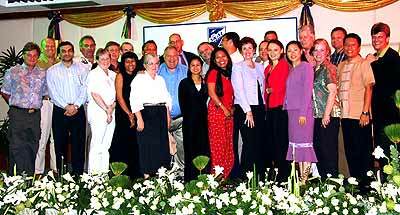 It was evident from those present that what counts more in the long run is the idea of comradeship that will develop between members and friends of Skål International - and the focus should be on our region - Northern Thailand, an area that covers 17 provinces. The monthly venues could be rotated through Chiang Mai, and the neighboring provinces. The next meeting will be held on the last Thursday in May, at the Mandarin Oriental Dhara Dhevi Resort in Chiang Mai. 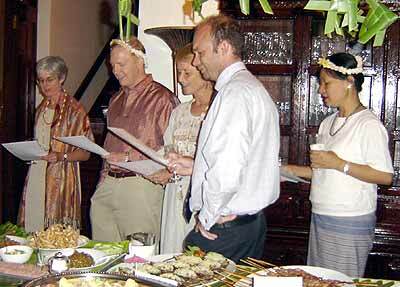 Nearly four years after touching down in Chiang Mai, the Jardine family is busily packing and being hosted and toasted at many farewell functions. Oh Henry? 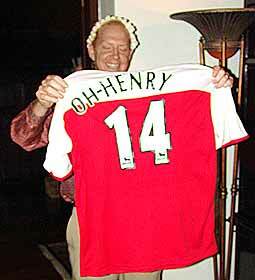 Or should it rather be o’Henry? Does this mean that those smiling eyes are Irish? 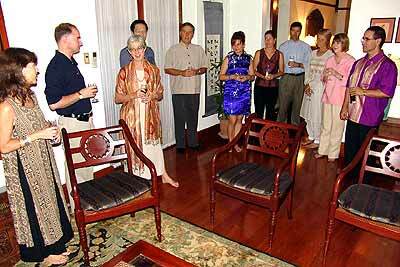 US Consul General Beatrice Camp and David Summers hosted a dinner at their residence, to bid farewell to Consul Henry Jardine and his wife Kathleen, and the place was packed with people partying, Trader Vic style. 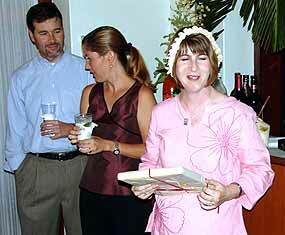 Kathleen Jardine expresses her thoughts after having received a small farewell token. Henry Jardine and his family will soon move to Calcutta, India where he will take his first post as consul general, a remarkable achievement for a diplomat way under the age of 40 (a doubter’s glimpse at his passport confirmed this). They will most certainly be missed, not only by Chiang Mai’s diplomatic corps and community but also by a number of bands that used to perform at various occasions on the consulate compound over the last four years. It will be a challenge for the US to fill the gap that Henry leaves behind, as who else would take the microphone and treat the, mostly bewildered and captive audiences to a very personal rendition of “My way”. Farewell and Bon Voyage to the Jardines, especially to Henry, truly a man and his music. Soon-to-be CG Henry Jardine, flanked by French Hon. 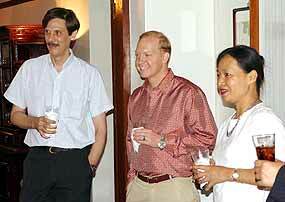 Consul Thomas Baude and his wife Chamaiphan. Colleagues and friends gathered to bid farewell to the Jardines. The angelic choir and their farewell song “Oh Henry”.